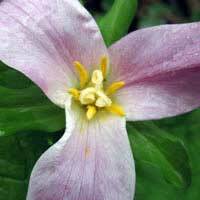 Trillium is one of the most beloved of all native plants. A small, white to pink, delicate plant, often found in deciduous forest or ravine with some moisture. It also likes a certain amount of low ground cover or deep forest duff around it. Foam flower is a good companion and it also looks good with most ferns. Arising about the same time as the robins return, it has been called the wake-robin.